The saying "breakfast is the most important meal of the day" may not be entirely true, but breakfast is certainly important when it comes to building muscle. 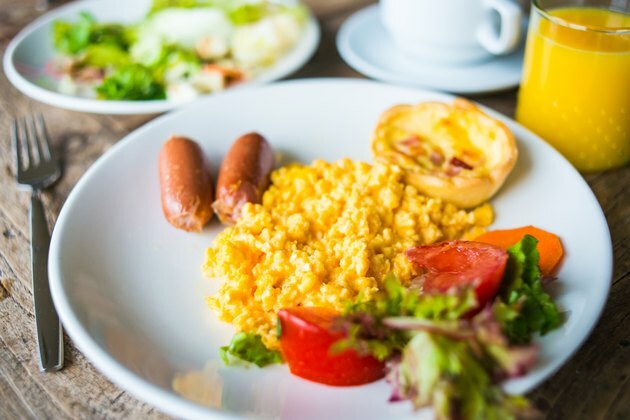 A large breakfast packed with protein and complex carbs is a key feature in any muscle-building plan, according to trainer Greg Merrit and sports scientist Jim Stoppani. Tailor your breakfast for super gains in size and strength. When you don't have time for a big breakfast, a super shake can fit the bill, says trainer Nate Green. Green suggests combining spinach, bananas, almond milk, protein powder and a big spoonful of almond or peanut butter in a blender. For more calories, add nuts and seeds or some nut oil, along with more fruit. One single egg contains about 6 grams of high-quality protein -- an essential component of building muscle -- notes dietitian Diane Welland. Keep things simple and serve eggs scrambled or boiled with some whole-wheat toast. Or make a frittata with cheese and veggies, such as mushrooms, peppers and asparagus. Or whip up eggs Benedict by poaching eggs and serving them on an English muffin with spinach, lean ham and Hollandaise sauce. If you thought oatmeal was a boring breakfast food, think again. Oats are a staple in many bodybuilders' diets, as they provide slow-digesting, complex carbs, which help keep energy levels high. One cup of dry oatmeal, which makes about 2 cups cooked, contains 307 muscle-building calories. Cook your oats with water or milk, then up the protein and calorie content by mixing in protein powder, peanut butter, or chopped pecans, cashews or other nuts. Experiment with recipes at breakfast, but make sure your meal contains protein and carbohydrate. Ensure that your breakfast fits in with the rest of your day's nutrition. You need about 20 calories per pound of body weight each day to gain muscle, according to Stoppani, and these calories should be distributed evenly throughout the day. For example, a 150-pound person needs 3,000 calories per day. If you're eating five meals per day, that means 600 calories at each -- so a 600-calorie breakfast is in order. How Many Calories Are in a Banana Smoothie? Will Quinoa Make You Fat?